The picture on the left recently appeared on the BBC West website. Yet again their posh-boy journalists are trying to get all street and down with the kids on us by uncritically talking-up absolutely anything to do with the artist de nos jours Banksy. We’re supposed to be getting excited now because Banksy’s popular ‘Mild, Mild West’ mural is going to be preserved behind glass and shoved in the atrium of some upmarket flats for yuppies being developed on Stokes Croft. In a disturbing sign of what’s to come as Banksy is dragged more and more by the media into the mainstream for easy consumption, the BBC seems to have made a not-very-subtle alteration to the painting. Where’s the Molotov Cocktail the bear was holding gone? This entry was posted in Banksy, Bristol, Developments, Media, Spot the difference. Bookmark the permalink. Thank you! As an ex-graf writer I think the way they are idolising Banksy is incredibly hypocritical. 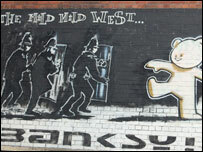 The best one was when the Evening Post ran the headline, “Vandals deface Banksy mural”. Graf writers have been going over each others pieces for decades, and not only did this hit the headlines, but the piece is now a “mural” and the rival writers “vandals” against the artistry of Banksy. Don’t get me wrong – good luck to the guy he should milk this time for all he can get. But the hypocrisy is deafening! Just to clarify, I only added “of Connecting Bristol fame” because you gave me such a hard time on that blog. I don’t hold grudges though. LOL By the way, I’m also ‘Teach’ (which is what you called me on my own blog) and ‘BrizBoy’. I directed that BBC doc I asked you to watch. I’ve come out from the shadows, will you??? ha ha ha. Just kidding. I actually really love your blog. Keep doing what you do!